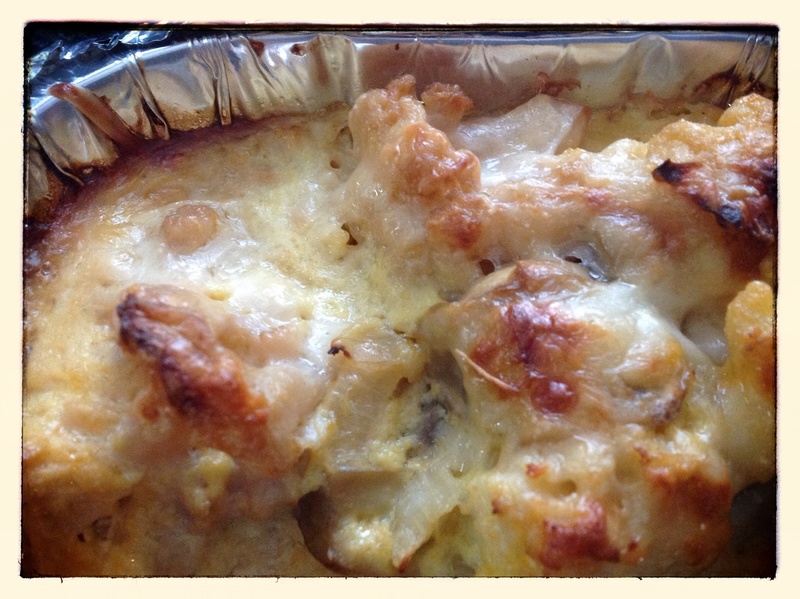 Nom, Nom, Nom….I can’t get enough of vegetable gratins! There is nothing more more-ish, and so comfort foodie, but without the high bad carbs, as eating a vegetable gratin, in this case the Cabbage, Asparagus & Leek Gratin! Nom, nom, nom….I can’t get enough, and what with autumn on the horizon, I suspect it will be my favorite dish. Absolute bliss. My stomach is in heaven! Heat the c/oil in a saucepan, and sauté the leeks until tender. Remove the leeks from the saucepan, and add the onion & garlic. Saute the onion until transparent, then add the cabbage and place a lid on your saucepan, until the cabbage is tender and cooked. You might need to stir it a few times! In another saucepan, bring salty water to a boil. Add the asparagus and cook for a few minutes. Then remove the asparagus from the water and put aside. Mix the cream, creme fraiche & cream cheese together with salt & pepper. In an ovenproof dish or tinfoil dish container, put all the vegetables together in. Ensure they are well mixed. Then pour on top the cream, c/fraiche & c/cheese mixture. Sprinkle with cheese. In a preheated oven of 170-180 degrees celsius, bake the dish for 20-30minutes OR until cooked and the cheese on top golden brown! This entry was posted in Baking as easy as 1..2..3, LCHF recipes and tagged asparagus, Atkins, banting, cabbage, cream, cream cheese, creme fraiche, gratin, LCHF, leeks, low carb, low carb vegetable bake, low carb vegetable gratin, sour cream, vegetable bake, vegetable gratin by angelb38. Bookmark the permalink.